One of the best compliments that a girl can receive is that she looks good without makeup. 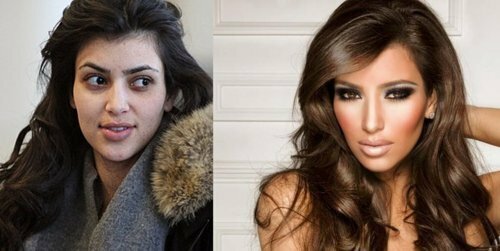 We’ve all seen the crazy celebrity tabloids that display beautiful stars like Kim Kardashian and Jennifer Lopez without makeup. Sometimes, they look good—natural and more like regular folks. But most of the time, you have to wonder: who is that sad, ugly person? You don’t want to be the girl who takes off her makeup and suddenly transforms. So, to help you avoid all that, I’ve found easy ways that will help you look and feel fabulous, with or without makeup. Since you won’t be caking on the foundation anymore, you’re going to need a way to keep your occasional breakouts from showing. One very important way to do this is simply by taking care of your skin. Go to a local pharmacy, dermatologist or beauty salon and talk to someone about creating your own skin care regime to help keep your skin fresh looking and breakout-free. I strongly recommend using Bioderma, it’s a facial cleanser that has honestly worked wonders for my skin. And also, if you’d like, invest in fish oil tablets. You’ll reap the benefits as it helps to maintain gorgeous skin, reduce the look of wrinkles and even, reverse sun damage. If you didn’t know this yet, with the pluck of a few hairs, your eyebrows have the ability to enhance, easily transform, and define the look of your face. If you want to look gorgeous without makeup, then take the time to keep them shaped. Take a look at pictures of Megan Fox without make up—you’ll see that she still looks flawless. I believe that it’s, well, duh, her natural beauty—but also, it’s because her eyebrows are still perfectly groomed, with or without makeup. Not that we’re trying to take the attention away from your beautiful face, but having luscious hair will definitely help you look gorgeous. To have good hair, either go out and get a new hair style, or maintain the one that you have now. Invest in products that come from the hair salon. It’ll help you achieve that straight-from-the-hair-salon look that will leave your hair constantly soft and shiny, and raking in the endless compliments! This is a no brainer. If you were tossing and turning all night—then obviously, in the morning, your eyes would be rocking some mad bags under them. Rather than caking on the concealer to hide them, try the Garnier Fructis Anti-Puff Eye Roller to deflate the look of the bags and start going to sleep every night at the same time. This way, it’ll become a habit and your body will begin to naturally fall asleep earlier and faster. Apparently, we’re supposed to be drinking eight glasses of water a day, but it’s kind of annoying to be running to the bathroom every five minutes. However, it’s still important to do—by drinking lots of water a day, we’re flushing out our bodies, and it has the benefits of helping you to lose weight, maintain healthy looking skin, and much, much more. So, skip the bottle of pop today and instead, drink water. Add some lemon it in to add flavour and start slow, but gradually make your way up to eight glasses a day. For those who look at celebrities and seem willing to give up an arm and a leg to look like them, you have to understand that most of the time it’s part beauty, part makeup, and oh, can’t forget, part Photoshop. To look good without makeup is all about maintenance and being comfortable in your own skin. From there, natural beauty will follow. Thanks for sharing your thoughts on how to look gorgeous without makeup. I really like it very much.